Last week a ruling from the federal Sixth Circuit Court of Appeals in Michigan was issued that caused quite a media stir, particularly on social media, and as a result many dog owners are up in arms. 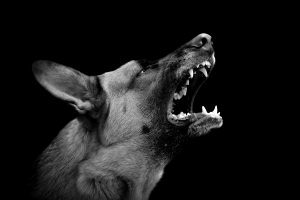 The ruling dealt with a police shooting of two dogs, and has been portrayed through various news pieces as granting the police the right to shoot your dog if it moves or barks. Just read the headline of one of the main news story shared: “Court: Police can shoot dog if it moves or barks when cop enters home.” It’s even been shared on social media as a new law empowering police with the unfettered right to shoot your dog with no real provocation. As so often happens, the media has sensationalized this case into something it is not. Despite these headlines leading dog owners to believe their dogs are not safe in the presence of police, no sweeping declarations were made giving police freedom to shoot a moving or barking dog. Let’s begin with the facts of the case. First, the police were at this residence to execute a search warrant subsequent to a trash pull that revealed baggies with marijuana and cocaine residue. Residents had known criminal history, gang affiliations, possession and use of firearms, and potential drug distribution out of the home. This was the atmosphere the police were entering on their raid, which quite reasonably put them on high alert for potential danger. So much so that the police met with the city’s Emergency Response Team (ERT) to prepare for the execution of the search warrant. Officers detained one of the residents, Mark Brown, upon reaching the home, which is where they saw a “Beware of Dog” sign outside the residence. A sign like this would lead any reasonable person to believe that the dogs on property may have dangerous propensities and to indeed “beware” of any dogs approaching them. This important piece of information was conveniently left out of the news stories. Once at the front door, the officers saw dogs jumping at the front window, one a 97 pound brown pit bull type dog, and the other a smaller white one about 53 pounds. There is conflicting testimony between the officers and Mark Brown as to whether the dogs were barking at this point. Most dogs, even the friendliest, are going to bark when strangers are approaching the front door, but that particular fact has little relevance given the totality of the circumstances. When the first officer entered the home, the large 97 pound dog lunged towards him, so he fired his first shot. The dog ran down the stairs into the basement, where he was then obstructing the path to the basement. The officer testified that he “did not feel the officers could safely clear the basement with those dogs down there” which speaks to the officers’ personal safety and ability to safely do their job. The dog was then fatally shot. The second dog was also in the basement barking at the officers, who then shot at her. She then ran to a corner of the basement, where another officer then shot her again as she moved out of the corner in his direction. She then ran to a back corner to hide; as she was bleeding profusely another officer shot her in order to put her out of her misery. This case presents a Fourth Amendment seizure issue much like the Oregon case discussed in a previous article. That case dealt with seizure of an animal by the government and whether a subsequent blood draw was an unreasonable search and seizure. It was also a case misrepresented in the news as granting new rights to animals when in actuality the court affirmed that dogs are property under the law. In this case, the owners of the dogs sued the city and the police department in federal court. They contended that the killing of the dog was an unreasonable seizure under the Fourth Amendment. They lost as the officers were granted summary judgment by the lower court; this was their appeal. Interestingly, this particular Circuit Court had not yet determined whether in general, the killing of a dog constitutes a “seizure” under the Fourth Amendment. However, the Court looked to the reasoning and rulings of every other circuit court that addressed the issue and came to the same conclusion. The Court held “a dog is property, and the unreasonable seizure of that property is a violation of the Fourth Amendment.” At real issue here was the reasonableness of the seizure. The Court quoted the DC Circuit court in looking to Fourth Amendment cases: “we analyze the question of whether a pet constitutes an imminent threat from the perspective of a reasonable officer on the scene, rather than with the 20/20 vision of hindsight.” The Court was attempting the difficult task of putting themselves into the shoes of the officers at the time of the shooting to determine whether the actions those officers took were reasonable. In this particular instance, the individual resident for whom the search warrant was issued was an actual and serious threat to the officers’ safety; his threat and the high-risk nature of this raid made the whole venture very dangerous. Case history demonstrated that the individual was very rarely alone, so the officers knew there was a very good chance that other members of the gang could be in the home at the time of the raid or nearby. Clearing the house of potentially dangerous, armed individuals was of the utmost importance and officers were justifiably on high alert. While there was conflicting testimony between the officers and witness Mark Brown as to whether the dogs were barking at the time the officers walked up to the home, this discrepancy is only about the barking at that moment and not about whether the officers were threatened by the dogs themselves. The fact that a 97 pound dog was loose and lunged at the officer who was going into a house on high alert for armed individuals was deemed a reasonable threat by the court. The Court found that the dog “posed a threat to the officers’ safety and it was necessary to shoot the dog in order for them to safely sweep the residence and insure that there were no other gang members in the residence and that the evidence was not being destroyed.” The other dog was deemed a reasonably perceived threat as well for the same reason: because the officers were unable to safely clear the basement with the distraction of the loose, barking dog, the shooting was necessary. This is a very important distinction from the impression the sensationalized news headlines are making. This case was so much more than a dog merely ‘moving’ towards an officer, or a police officer knocking on a door to a family residence and shooting a dog just for barking. The totality of the circumstances here demonstrates there is more than meets the eye. Officers have to make split second decisions to ensure safety and a 97 pound dog lunging toward a person who is anticipating armed gang members is a reasonable and understandable perceived threat. No one wants to see a dog injured or killed. But these officers put their lives on the line daily, and their lives are the priority. It’s easy for outsiders who have never experienced this situation to pass judgement, but the officers in this case were clearly threatened. Bottom line, the case was deciding this particular situation and this particular set of circumstances and did not make a new law or set new precedent for future police action. This entry was posted in Uncategorized and tagged Animal Law, Dog Shootings, Police on December 30, 2016 by Patti Strand.